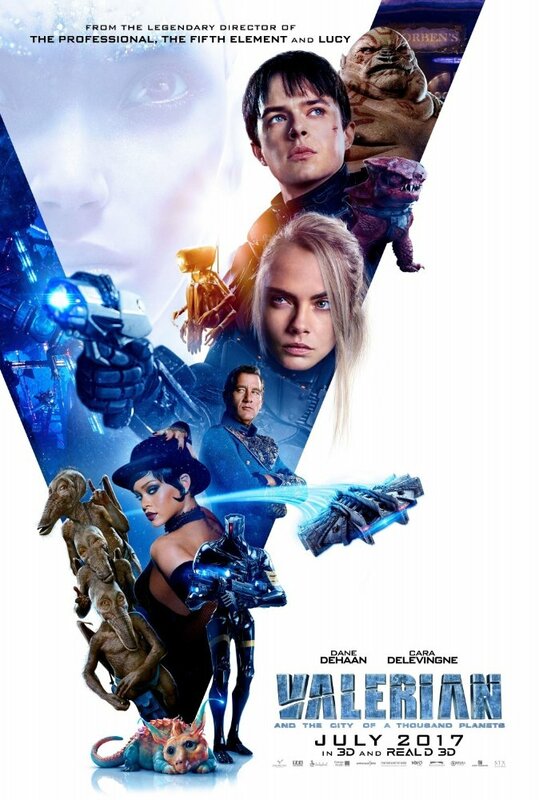 Valerian and the City of a Thousand Planets is based on a 1960s French comic book series called Valerian and Laureline, the two main characters, and while the title sounds as bizarre as you’d expect from Besson, it’s based on two of those volumes, The City of Shifting Waters and Empire of a Thousand Planets. Not having heard of them before I’d first heard of this film, I don’t know how far this film strays from the comics, or whether it just borrows the main characters and elements from them, but talking of elements, the first time I saw the initial teaser, and knowing it was Luc Besson, it felt very ‘The Fifth Element‘, which is a pretty good thing. You can also tell when Besson borrows from other sci-fi here and there, including when Valerian has to deal with a character that’s basically Jabba The Hut. The film begins with David Bowie’s Space Oddity playing while we see the emergency and success of Alpha, a space station that’s getting so big that it’s affecting Earth’s gravity, hence, it’s set free to drift off into space. It became a success because it’s home to hundreds of species from all over the galaxy, all getting along and exchanging knowledge and ideas, so it’s a utopia… except that it’s about to be under attack from someone with weapons of mass destruction. However, due to the population, that’s why it’s referred to as a ‘city of a thousand planets’. Makes for a snappy name. Meanwhile, 400 years earlier, is a planet called Mül where pearls are bountiful and, periodically, the Avatar-style creatures who live there want to ‘give back to nature’. Letting a hedgehog-like creature eat one of these results in it po -oing out a load *more* pearls,all pearls which have ten times the power of V&L’s spaceship. Yes, there’s a character that excretes pearls. That is part of the plot. 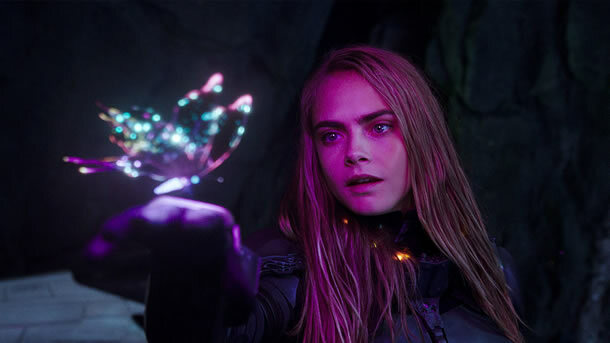 Their world also becomes under threat, and Valerian and Laureline are brought into this, in ways you’ll discover before too long, to sort things out. Oh, and to pad things out even longer, there’s a plot to kidnap Commander Filitt (Clive Owen, running on low power). When we meet the two leads, portrayed, respectively, by Dane DeHaan and Cara Delevingne, the question isn’t so much of how she keeps getting acting work (she is to this what Kate Capshaw was to Indiana Jones and the Temple of Doom – and see how quickly she disappeared off the blockbuster scene), but that when they’re fooling around while she’s holding a full glass of orange drink, how come none gets spilled?! Another question is that the pair in the comics not only travel through space, but also through time, although there’s only the former in this movie. I would’ve liked some of the latter. Set in the 28th Century, the film does have frequent and superb use of 3D which does make it worth the extra (even though the cinemas have surely recovered their costs by now). Only occasionally did the 3D *not* work too well, and that was for some establishing shots of Alpha as they went back to the action on there, periodically. That could’ve been because it was such a huge scene with a lot going on, and set in space – which is dark – so when you’ve just changed from a lighter image, it takes a little while to adjust, but because it’s an establishing shot, it comes and goes quickly. I’m sure it could’ve been better, overall, though, if they’d actually spent the extra money shooting it in 3D. Michael Bay said it cost $10-15m for this to be a fact in Transformers: The Last Knight, so far the ONLY live-action movie shot in 3D in 2017. Similarly, it has a completely incomprehensible plot. To think that the film was billed by the studio as “The 3D event of the year”… when it’s not. That’s clearly the aforementioned Bay movie. Back to V&L, and of course, it does go on far too long, even if it’s rarely boring, but at 137 minutes, 30 of those crash/bash/smash minutes could easily be chopped out. You could attribute this to situations such as, at one point, Valerian goes missing and Laureline has to track him down, and then Laureline goes missing and *Valerian* has to track *her* down. That said, normally, he’s a good actor, but in this movie, he seems miscast as a lothario, as he’s just not the type. There’s a tour guide who I briefly thought was played by Russell Brand but, thankfully not. It’s a chap called Eric Lampaert. Cara’s spacesuit is denoted a female model by containing areas for a heaving bosom, although my moobs contain more flesh! Talking of actresses without any clout, pop star Rihanna has a role as a chanteuse in a nightclub… as Bubble. No, not that mockney irritant from Big Brother 2!! With a budget of around $180m, making it the most expensive French movie ever made, and in its opening week in the US, it grossed less than $18m. Looking at the Top 10 grossing films of the year so far, Marvel are almost running away with the crown, only beaten by Beauty and the Beast, while DC’s Wonder Woman is also in the Top 5, so you can understand a studio wanting a new superhero franchise, but when they give almost 200m Euros to Luc Besson, who then makes a fairly entertaining film which I enjoyed more than both the dull Spider-Man Homecoming and lacklustre Wonder Woman, it feels that because it’s not Marvel – in particular – the critics slam it. That said, like The Adventures of Buckaroo Banzai Across the 8th Dimension, it has the makings of a cult classic. Finally, as often happens at Vue Cinemas, it’s a shame the lights are still always so bright during the end credits, completely ruining the atmosphere. I’ve tried addressing this with the powers that be, yet have still got nowhere. If you manage to discover someone who cares at Vue, let me know. 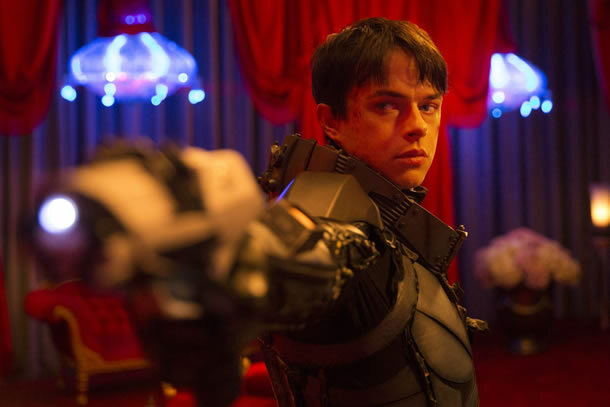 Valerian and the City of a Thousand Planets is available to pre-order on 3D Blu-ray, Blu-ray, 4K Blu-ray, Amazon Prime, DVD, and you can buy the CD soundtrack now. …and that’s NOT a euphemism.